- Why so few right whales? 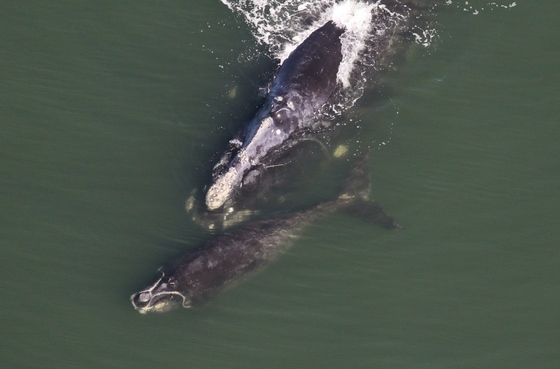 Already endangered, North Atlantic right whales face an even more uncertain future following the Southeast’s second-worst calving season since surveys began in the 1980s. Researchers with Georgia DNR, the Florida Fish and Wildlife Conservation Commission, NOAA and Sea to Shore Alliance saw only seven right whales this winter off Georgia, north Florida and South Carolina, traditionally calving central for this species that literally grows as big as a bus. Only three of those whales were calves (a fourth calf was seen in Cape Cod Bay this month). Clay George, DNR’s lead right whale scientist, said the average number of calves reported in the region has dropped by half, from 24 calves annually 2001-2011 to 12 a year since 2012. This winter also registered a new low for the total number of right whales seen in the region. Season totals topped 100 per year in the mid-2000s. Read more about this trend, and hopes for a reversal. Each year on a warm afternoon in mid-March I surrender to the urge to find my first zebra of the year in Georgia. 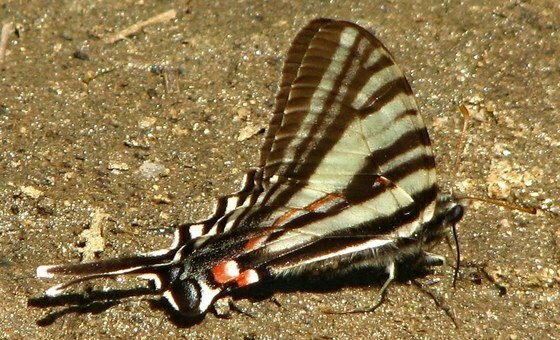 Zebra swallowtail, that is. From experience, I have learned that the best chance of seeing these eye-catching butterflies is in open, hardwood forests. And in March into early April, these woodlands are usually leafless, allowing the bright spring sunshine to reach the forest floor, unfiltered by a myriad of green leaves. Read Terry’s column to learn where to search for these flying zebras. P.S. : Here’s a tip on taking close-up photos of butterflies and flowers. Coming up: Terry is giving a presentation at the Spring Gardening Symposium May 5 at the Plains (Ga.) Community Center. The workshop is held by The Garden Club of Georgia’s Plains Chautauqua Magnolia District and the Rosalynn Carter Butterfly Trail. Register online. Details: plainsed@gmail.com, (229) 824-4567. Alapaha River Wildlife Management Area had achieved near-legendary status in some circles well before the 6,869 acres were opened as a WMA on Sept. 30. 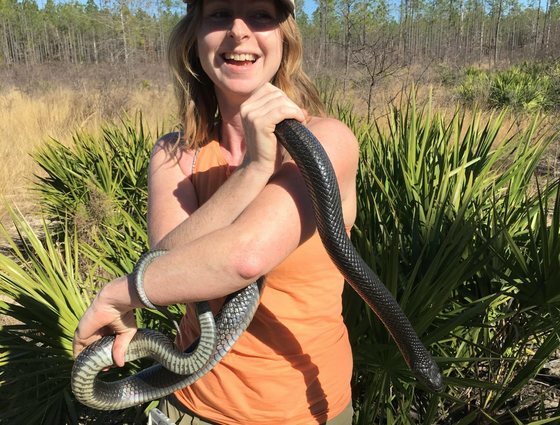 The site has been variously known as the Lentile Tract, the Snake Sanctuary, Dan Speake’s indigo snake study site (by herpetologists familiar with the work of the Auburn University wildlife professor emeritus) and the Pasture (by local hunters). Providing the border along Irwin and Tift counties between Tifton and Ocilla, the Alapaha River at this point is more a series of lakes connected by vast floodplain forests than a constant flowing stream. During the Wisconsinan glaciation of the Pleistocene epoch, about 20,000 to 25,000 years ago, cold westerly winds blew across what was then a dry riverbed, piling up massive amounts of quartz sand on the lee side. Explore the wildlife and habitats of Alapaha River WMA in this blog post. Matt Elliott is assistant chief of the Nongame Conservation Section in DNR’s Wildlife Resources Division. This article originally ran in The Longleaf Leader, quarterly magazine of The Longleaf Alliance. How can you help conserve rare Georgia wildlife and wild places like Alapaha River WMA now and for future generations? One way is through an estate, memorial or other gift to the Georgia Nongame Wildlife Conservation Fund. The Nongame Wildlife Conservation Fund is dedicated by state law to support conservation of rare and other native wildlife that aren’t legally hunted, fished for or collected, plus rare native plants and the habitats these species need. In 2016, the fund received $3,416 in gifts to help preserve wildlife. For details on how to contribute, call the Nongame Conservation Section at (770) 761-3035. Gov. Nathan Deal signed House Bill 208 Tuesday at DNR Coastal Regional Headquarters in Brunswick. Effective July 1, the changes will simplify Georgia's hunting and fishing license structure and adjust fees for resident hunting and fishing licenses for the first time since 1992, ranking Georgia in the middle of other Southeastern states for resident license fees. Support for the changes was strong. With the additional revenue, DNR will improve wildlife and fish habitat and management on public and private lands and waters; create more shooting ranges; improve boating access; add youth education opportunities; increase fish stocking; and, add approximately 40 conservation rangers. 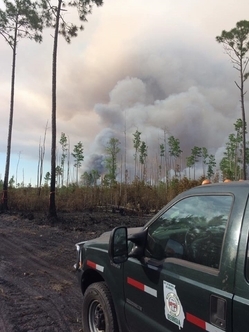 The West Mims wildfire at Okefenokee National Wildlife Refuge grew to more than 60,000 acres this week. Fire and support crews of nearly 500 people, including DNR Wildlife Resources Division staff, are working to contain the blaze started by lightning April 6 on the swamp’s southwest side. Wildfire overview. Southern Fire Exchange fact sheet: Prescribed fire and wildfire risk reduction. A helicopter survey of nesting Florida sandhill cranes at Okefenokee NWR documented 11 active or recently active crane nests before remaining flights were cancelled by the wildfire. DNR survey leader Todd Schneider said a reconnaissance flight also marked a promising area not surveyed before. Reticulated flatwoods salamanders are on a run, figuratively, at Mayhaw Wildlife Management Area. A larva caught in March by DNR wildlife biologist Thomas Floyd confirmed a second straight year of reproduction at the southwest Georgia WMA. The endangered sallies were re-discovered at Mayhaw in 2015, the first time the species had been documented in Georgia in more than a decade (“Rare salamanders," March 31, 2015). Sampling for sicklefin redhorse by fyke nets in Brasstown Creek, Georgia’s only known population of the rare suckers, helped DNR and partners catch, PIT-tag and release 95 sicklefins, 12 of them tagged before. High flows complicated netting in the Nottely River aimed at confirming there are no sicklefin redhorse in that waterway, key to possibly restoring the species upstream of Lake Nottely. East Georgia State College biology students and Swainsboro Middle School Sci-Fries Club members helped DNR staff plant endangered pond spice and pondberry at Ohoopee Dunes Wildlife Management Area in March. The project also benefited from other Georgia Plant Conservation Alliance members such as Chattahoochee Nature Center and Beech Hollow Farms. Photos. Nesting season is on for Georgia’s beach-nesting birds, and DNR is encouraging beach-goers to steer clear of areas these birds and fellow migrants need to nest and forage. Tips on sharing the beach. 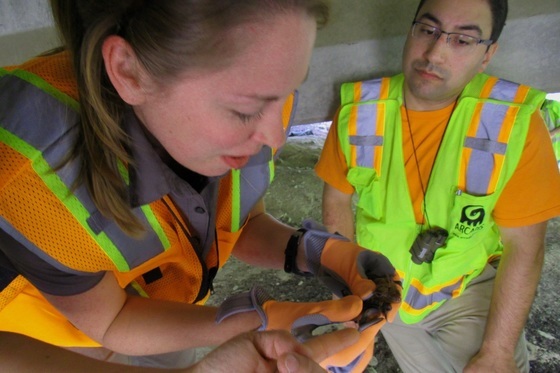 Georgia’s fourth annual Bat Blitz will help researchers collect data on bats in and around Vogel State Park in northeast Georgia May 11-14. Organized by the Georgia Bat Working Group, the blitz also features a mist-netting demonstration and other "batty” activities for the public on May 12. Four budding bird artists have been selected as T-shirt Art Contest winners in DNR’s 12th annual Youth Birding Competition. 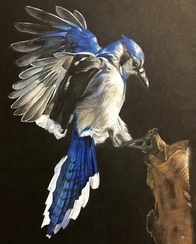 See their work – including the blue-ribbon blue jay (left) by overall winner Ava Wang of Duluth – and stay tuned to Facebook for news from the 24-hour birding competition this weekend. Searching for a summer camp that offers adventure? Explore Charlie Elliott Wildlife Center's sessions for ages 7-16, including a new Wilderness Survival Camp. Moody Forest is now home to three red-cockaded woodpecker groups and a pair of nesting bald eagles. The latest addition of endangered woodpeckers at the WMA near Baxley include two moved from Fort Stewart and one from Silver Lake WMA last year, while the eagle nest, with two eaglets, was spotted recently. Raptor nest updates: As of earlier this week, the Berry College eaglets were branching – an exploratory phase before fledging – the Tallulah Gorge peregrine falcons were caring for four eyases and ospreys at The Landings were incubating their two eggs. Watch eagles and ospreys at www.georgiawildlife.com/cams. Volunteers filled about 50 bags with trash and hauled away tires and other large junk items during an April 15 cleanup organized by Flint Riverkeeper and DNR at Sprewell Bluff Wildlife Management Area near Thomaston. Georgia coast boaters should be on the lookout for sea turtles and manatees. Boat strikes are a leading cause of injuries and deaths for these protected animals. Boaters who hit one are urged to immediately call DNR at 800-2-SAVE-ME (800-272-8363). Raccoons, deer and other animals are often labeled a nuisance when they develop intrusive and destructive habits in suburban settings. But homeowners can play a role in keeping wildlife from becoming a nuisance by limiting easy access to food. Here's how. #FridaysontheFarm offers weekly stories of farmers, producers and landowners who are helped by the USDA Natural Resources Conservation Service and others partners to “help the land.” Included: Front Field Farm, a Georgia organic farm engineered with water-saving irrigation. 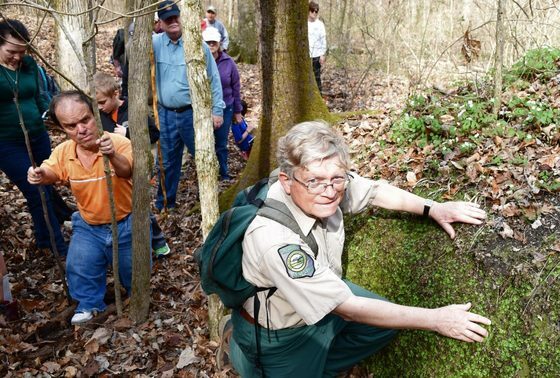 Botanist Tom Patrick (above) of the Nongame Conservation Section explained rare plants and habitats such as Blackland, or chalk, prairies, during a February hike with about 50 people at Oaky Woods Wildlife Management Area near Kathleen. Patrick discusses chalk prairies in this video. Names in the news: Former Georgia Gov. Sonny Perdue said after being sworn in as U.S. agriculture secretary Tuesday that the only legacy he seeks is the one "that any grandparent or parent seeks – to be good stewards, and to hand off our nation, our home, our fields, our forests and our farms to the next generation in better shape than we found it.” His USDA Twitter handle is @SecretarySonny. Writer and veterinarian Dr. Abbie Gascho Landis, wife of former DNR mussel scientist Andrew Gascho Landis, has written “Immersion: The Science and Mystery of Freshwater Mussels” (Island Press). Two-time Pulitzer Prize winner E.O. Wilson called the book “nature writing at its best.” Dr. Lindsay Boring is retiring as director of the Joseph W. Jones Ecological Research Center at Ichauway July 4. 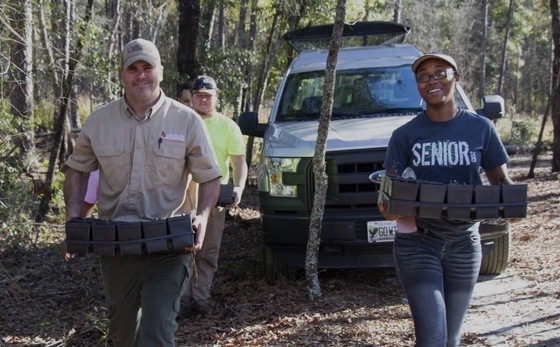 His successor: Dr. Kier Klepzig, currently assistant director at the U.S. Forest Service's Southern Research Station in Asheville, N.C. Georgia Adopt-A-Stream has named Kevin Smith, a Keep Forsyth County Beautiful outreach specialist, 2016 Trainer of the Year. April 28-29 – Native Plant Botanical Garden plant sales, 10 a.m.-2 p.m., Georgia Perimeter College, Decatur. Also: May 5-6, 12, 19-20, 26-27. May 11 – Montane longleaf pine meeting for area landowners (ecosystem, fire management and planting opportunities), 6:30-8:30 p.m., Paulding Meadows Park, Dallas. Organized by Paulding County UGA Extension Office and The Nature Conservancy. Pre-registration required: 770.443.7616 or uge2223@uga.edu. May 12 – Foothills Landscape Project field trip (focus: Watergauge Forest Health & Wildlife Habitat Improvement Project on Chattahoochee National Forest Chattooga River Ranger District), 9 a.m.-1 p.m., Lakemont. Registration: Angie Bell, FoothillsLandscape@fs.fed.us, (770) 297-3095. May 13 – Bird banding, 5:20 a.m., at Panola Mountain State Park, Stockbridge. Also: 5:15 a.m. May 28. June-August dates in upcoming issues. Contact Charlie Muise, Georgia Important Bird Areas Program. June 3-8 – Camp TALON (Teen Adventures in Learning Ornithology and Nature), St. Simons Island. Register by May 5. July 7-9 – Beyond Becoming an Outdoor-woman (BOW) handgun preparedness course, Charlie Elliott Wildlife Center, Mansfield. Also: July 21-24, Coastal BOW, Sapelo Island; Sept. 8-10, advanced handgun workshop, Charlie Elliott; Nov. 3-5, annual BOW workshop, Charlie Elliott. – Defense Department strategy is good news for gophers. – Finessing fire to restore habitat at Big Dukes Pond WMA. – Decatur kindergarteners raise money for rare species. 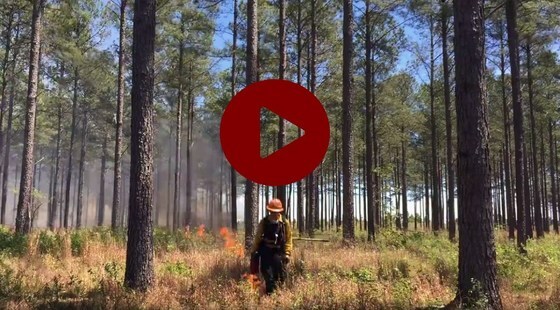 – Time-lapse of an April 10 prescribed burn on Fall Line Sandhills Wildlife Management Area by DNR’s west-central Georgia fire crew. Senior wildlife biologist Nathan Klaus videoed the burn. 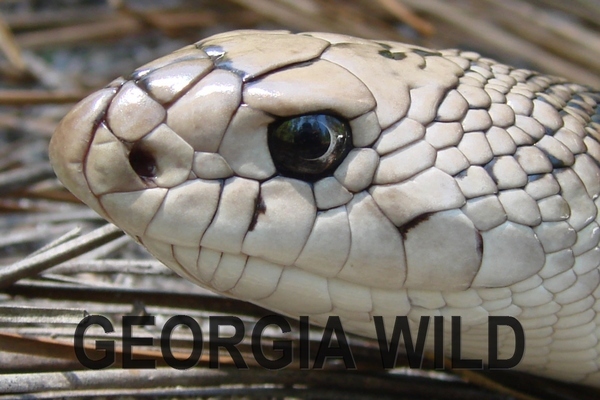 Masthead image: pine snake (Beth Schlimm). Coastal Plain populations of this species are associated with xeric habitats with deep sandy soils, such as those found at Alapaha River WMA.